At the direction of the USS Trustee, employers are consulting scheme members on cost sharing. The proposal will result in increased contributions for both members and employers. Listed below is a PDF explainer of the process and next steps, as well as an infographic outlining the detail behind the proposed increases to employer contributions. All percentages refer to a percentage of salary. All proposed contribution increases are subject to consultation. Following consultation with members and employers, the 2017 valuation has been now been finalised. 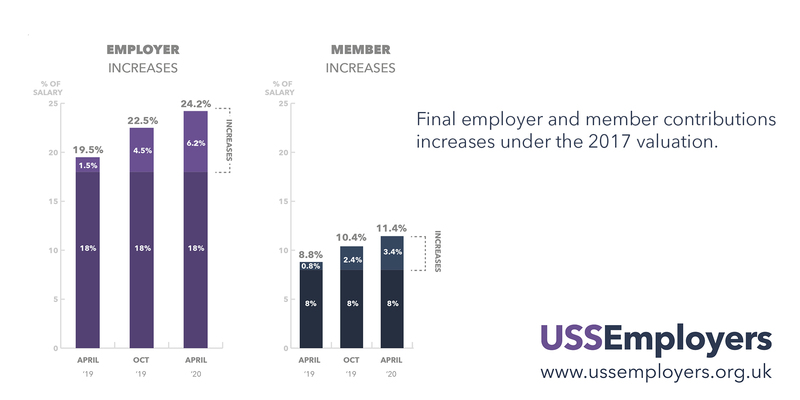 The USS Trustee has confirmed that any new agreement arising from the 2018 valuation process will supersede the cost sharing contributions increases.